Recipes - Eunice Power Outside Catering Company, Ireland. You'll be mixing the batter for the three cake layers separately, and baking them for different lengths of time, to account for the differing cake tin sizes you'll be using. You will need one 15cm/6in tin, one 23cm/9in tin and one 30.5cm/12in tin. The smallest cake bakes for 35-40 minutes, the middle tier for 40-45 minutes and the largest for about 75 minutes. In each case the oven temperature is 180 degrees. METHOD FOR THE CAKE: Melt the butter over a gentle heat, set it aside. Line the base and sides of the tin with greaseproof paper. Whisk the eggs until foamy, then gradually add the sugar. Whisk for about 20 minutes, or until very thick and pale and you reach the "ribbon stage" - when the whisk leaves a ribbon-like trail. Sift half the flour over the egg mixture. Fold in gently with a metal spoon. Repeat with the remaining flour, and fold in until there are no flour pockets left. Spoon the melted butter around the edge of the mixture and gently fold it in with three or four very light movements of the spoon. Be gentle with the mixture - the aim is to retain as much air in the eggs as possible. Pour the mixture into the cake tin. Bake at 180°C for the required length of time. When cooked, the cake should be well risen, firm to the touch in the centre and just pulling away from the edges of the tin. Leave in the tin for five to 10 minutes. Loosen the sides of the cake and turn it out onto a paper-lined cooling rack. Leave it to cool upside down to give a flat top. When the sponge is cold, wrap it and store it for up to two days. METHOD FOR THE MOUSSE: You will also be making the dark chocolate mousse in three batches. The first step in the method for all three is the same, but the quantities differ. For the top tier, sprinkle the gelatine over 30ml cold water in a heatproof bowl and set it aside. Put the broken chocolate in a heatproof bowl with 50ml cold water. For the middle batch of mousse, sprinkle the gelatine over 60ml cold water and put the chocolate in a heatproof bowl with 100ml cold water. For the largest batch, use 150ml cold water for the gelatine and 200ml cold water for the chocolate. The next step, in each case, is the same. Whip the cream until it stands in soft peaks, then chill it. Put the chocolate with the cold water over a pan of simmering water and stir until melted. Remove the chocolate from the heat and stir in the brandy and egg yolks, reserving the egg whites. Cool the mixture, and then fold in the whipped cream. Melt the gelatine over a pan of simmering water until it is clear. Allow it to cool a little, then stir this into the chocolate. Chill until lightly set; about 15 minutes. Whisk the egg whites until stiff, and then fold them carefully into the chilled chocolate mixture. Chill the mousse in the fridge for about 30-40 minutes. TO SANDWICH THE CAKES: Carefully cut each cake horizontally into three, using a long-bladed, serrated knife. Use a flat baking sheet to lift and support the layers when sandwiching them. Lightly oil the original cake tin and line the base and the sides with greaseproof paper, making a collar to stand 7.5cm (3in) above the tin. Place one cake layer in the base of the tin, cut side uppermost. Spread with half the mousse. Place the second layer of cake on the mousse; gently press down. Spread the remaining mousse over the top and cover with the third piece of cake, cut side down. Cover with clingfilm and chill overnight. Remove the sandwiched cake from the tin, wrap it up and it can now be frozen, if you wish. Repeat the process for the other cakes. TO POSITION THE CAKE: Make sure all your cakes (except the bottom one, which should be sitting on a heavy duty cake board or drum at least two to four inches bigger than the cake), are sitting on thin cake boards the same size as the cake. Cut four pieces of dowelling 2cm longer than the depth of the bottom tier and four pieces 2cm longer than the depth of the middle tier. Insert four pieces of dowelling around the middle of the bottom tier. The circle should be slightly smaller than the middle tier cake base. Gently hold the middle tier above the bottom tier to ensure that it is level, and then set it aside. Repeat the same procedure with the dowelling for the middle tier. Keep the cakes in the fridge until needed. METHOD FOR SWISS MERINGUE: You'll be making this in one batch. Place the egg whites and sugar in a large metal or glass bowl. Set the bowl over a pot of simmering water, and whisk, continuously, until the sugar has dissolved and the mixture looks opaque. Remove the bowl from the heat, add the vanilla extract, and whip on high speed until it is completely cool. Whip in the butter, a tablespoon at a time, until thick and fluffy. If it begins to look curdled, whip until it comes back together, before adding the remaining butter. If the egg whites and/or butter are slightly too warm, it may not thicken. This can be remedied by placing it in the fridge for 20-30 minutes, then whipping again. TO DECORATE: Position the bottom tier on the cake board. Using a palate knife, spread half the icing over the top and sides of the cake. Place the next two layers on their cake boards and repeat. Put the cakes in the fridge and allow the icing to set. If you find pastry difficult to make or just don’t like making it you will love this recipe. A buttery, almond base, topped with delicious mincemeat and crunchy almonds. A good quality mincemeat is paramount to the success and flavour. Line a 20x23cm baking tin. Preheat your oven to 160 degrees/gas 3. For the base: blitz the butter, flour, baking powder, ground almonds and sugar in a food processor until the mix achieves a crumb like consistency. Add in the egg yolks and mix well until you get a sticky dough. Press the dough into the base of the prepared tin (I usually place parchment paper over the top and press and smooth the dough with my fingers or the back of a spoon). Bake for 25-30 minutes until golden - it will rise slightly. For the topping: whisk the egg whites until stiff in a clean stainless steel bowl, fold in the mincemeat and half the almonds. Smooth this mixture over the almond base and scatter the remaining almonds on top. Return to the oven and bake for another 20-25 minutes until the mixture is a light golden colour. Allow to cool in the tin for 15 minutes then transfer to a wire rack, peeling the paper off the base. Cut in 12 squares, dust with icing sugar before serving. This will keep for several days in a tin. If you didn’t get around to making a Christmas cake (or if you have sold all your Christmas cakes . . . of which I am guilty), but like having a fruit cake in the tin for Christmas – this is for you. Combined the orange juice and rind, sultanas and brandy and soak overnight in a sealed container. Cream the butter and sugar until white and creamy and then beat in the eggs one at a time. Fold in sifted flour, nutmeg and baking powder, taking care not to over-mix. Mix in the fruit. Bake in a 23cm/ 9in round cake tin, or two loaf tins, which have been lined with greaseproof paper. The large cake will take two and a half to three hours at 160-150 degrees/gas 3/2, depending on your oven, and the smaller cakes will take less time. 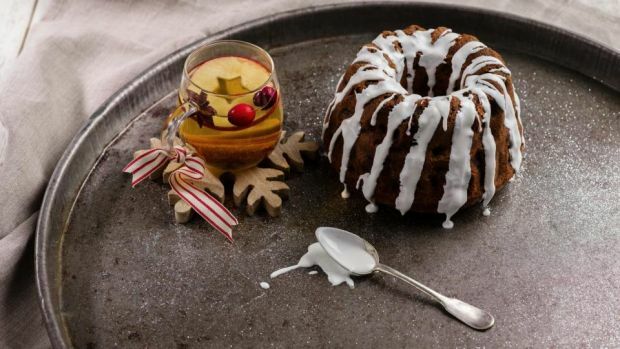 Make icing by sieving the icing sugar and stir in the orange juice - drizzle over the cake when it is cold. 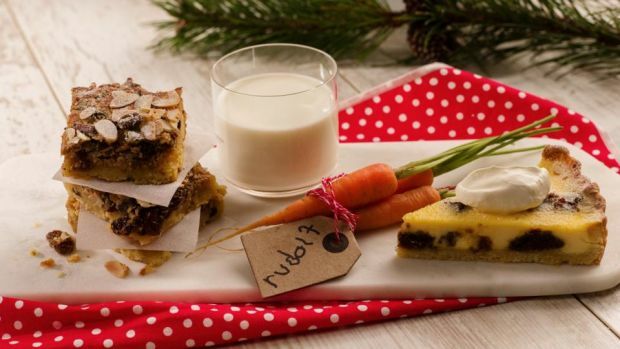 An all-in-one Christmas pud and custard in a tart. Served with a large dollop of cream as an absolutely delicious dessert for Christmas day as well as an excellent way to tart up left over Christmas pudding – pardon the pun! Lightly butter a 23cm/9in tart tin and put it in the fridge. Put the flour, and icing sugar in a food processor and aerate with a couple of quick on/off pulses. Add the butter and process until the mixture resembles fine breadcrumbs. Add the egg yolk and some water (if necessary) and process until the pastry just draws together. Turn it out on to a lightly floured work surface and knead briefly to form a flat round. Wrap the pastry in cling film and chill for at least 20 minutes before rolling out. Chill the tart tin, too. Pre-heat the oven to 190 degrees/gas 5. Roll the pastry out to a round at least five centimetres (two inches) larger than the tin. Wrap the pastry around the rolling pin, lift into place and unroll loosely over the tin. Gently lift and press the pastry into the tin to line, then roll the rolling pin over the top of the tin to trim off the excess pastry. Line the chilled pastry case with baking parchment, fill with baking beans and bake for 10 minutes. Carefully remove the beans and paper and cook for another 10 minutes or a little longer, until it is a light biscuit brown colour. Turn down the oven temperature to 140 degrees/gas 1. For the filling: break up the Christmas pudding into chunks and spread over the base of the tart. Whisk the two whole eggs, the extra yolks and the sugar in a heatproof bowl over simmering water, with a metal whisk, until smooth. Set aside. Put the cream into a medium saucepan. Stir the split vanilla pod and seeds into the cream. Heat the liquid gently until hot but not boiling, stirring regularly. Slowly stir this into the egg mixture until thoroughly combined. Pour the custard into the pastry case. Bake in the oven for 40-45 minutes, or until only just set. The custard should still be fairly wobbly in the middle, as it will continue to set as it cools. Remove from the oven and allow to cool before cutting and serving. Serve with softly whipped cream. 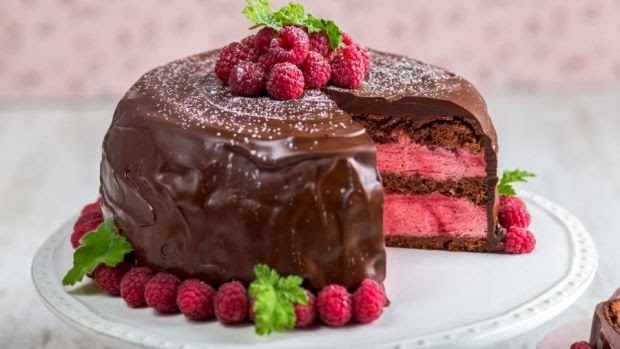 This is the best cake you will ever eat - light chocolate sponge with the sharp flavour of raspberry mousse. Thank you to Garrett Byrne of Kilkenny's Campagne restaurant for sharing this mousse recipe with me. Grease and line a 20cm/8inch tin with baking parchment. If you grease the tin first it's easier to get the paper to stick to the tin. Begin by making the sponge. In the bowl of an electric mixer add the eggs and sugar, whisk on a medium speed for 8/10 minutes until the mixture has trebled in size and has a light mousse-like appearance. Sieve the cocoa powder and flour together. Using a metal spoon fold the sieved flour and cocoa powder into the whisked egg and sugar. Do this a little at a time folding gently as each addition is incorporated. Pour the mixture into the prepared tin. Smooth the top and bake in a pre-heated oven at 170 degrees/gas 3 for 20 minutes or so, until springy and coming away from the side of the tin. 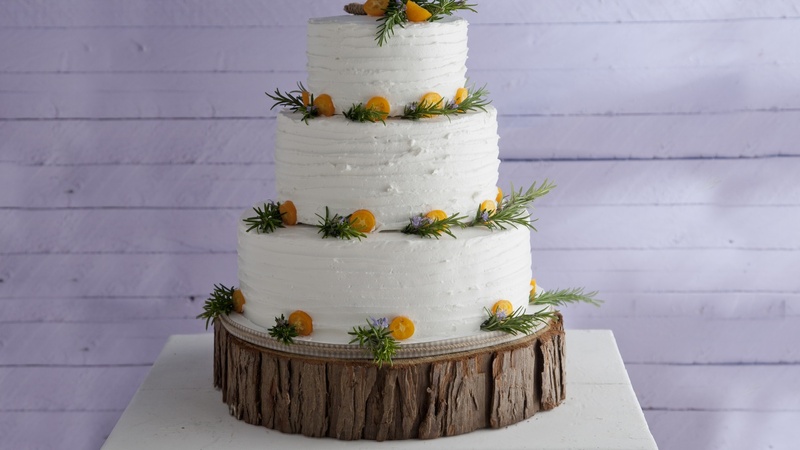 Allow to cool in the tin for five minutes then carefully turn out on a wire rack, leaving the smooth bottom of the cake facing up to avoid being indented by the wire rack - this helps when it comes to decorating. For the mousse, soak the gelatine leaves in cold water for 10 minutes. Put the sugar and water in a heavy-based saucepan and simmer until the sugar is dissolved, then let it cook to a dark caramel. This will take just a few minutes, so keep a watchful eye on it. Reduce the heat and add the raspberries, lemon juice and zest, cook for five to seven minutes, then purée in a food processor. Place a fine nylon sieve over a heatproof bowl and pass the puréed mixture through the sieve. You should be left with just seeds in the sieve. Add the soaked gelatine to the raspberry purée and place bowl over a pan of simmering water. Stir the purée, into which the gelatine should now dissolve. This should take just a minute or two. Whip the cream and crème fraîche to soft peaks. Be careful not to over-whip, if you do the cream will be lumpy and hard to incorporate with the egg whites and purée. Now whisk the egg whites. As they stiffen, add the icing sugar, bit by bit. Fold the egg whites into the cream and then fold in the cooled raspberry purée. For the ganache, melt the butter and chocolate together in a heat-proof bowl over a saucepan of simmering water. The butter content will give the ganache its silky, glossy finish. Allow it to cool down for 15 to 20 minutes. As it cools, it will set slightly and become more manageable to work with. To assemble: first, line the tin in which you baked the cake with cling film. If you oil the tin lightly it will give the cling film more purchase. Then line the sides of the tin with baking parchment. The parchment should come up at least an inch over the top of the tin. When the cake is completely cooled, slice horizontally into three equal layers. Place the bottom layer (this will be the top of the cake when the cake is turned out) into the base of the tin. Pour half the mousse into the tin and spread evenly over the cake. Now place the middle layer of cake on top of the mousse and pour in the remaining mousse. Place the remaining layer on top. Leave in the fridge for a few hours or, better still, overnight to set. When the mousse is fully set, turn the cake out onto a serving plate. Pour the ganache on top of the cake then, using a palette knife, gently coax the ganache down onto the sides of the cake until it is covered evenly. Decorate with raspberries and some pretty leaves, dusted liberally with icing sugar. If you are putting candles in the cake it's probably a good idea to pop these in before the icing sets properly. Ideally the cake should stay in a cool place until needed but don't put it in the fridge if you can avoid doing so, as the chocolate ganache will lose its beautiful lustre. Rhubarb and spring arrive together. I love Rhubarb. It's the first to wave the 'I have survived the winter' flag in my otherwise desolate garden. Last Autumn I put my Rhubarb to bed under a duvet of well rotted manure, my efforts were rewarded as my rhubarb peeked above ground a month early from its winter slumber pink and ready to be plucked. 1 dessert spoon of Arrowroot. Wash and slice the Rhubarb. On a gentle heat dissolve the sugar in the orange juice and water, Allow to simmer and add the rhubarb and orange rind, Simmer for 3 to 4 minutes and turn off the heat. Allow to cool. Strain off the rhubarb and return the syrup to the saucepan. Dissolve the arrowroot in a tablespoon of water then add to the syrup. Return to the syrup to the stove and simmer for 5 minutes until the syrup thickens. Take off the heat, allow to cool, return the Rhubarb. And there you have wonderful compote with so many possibilities. 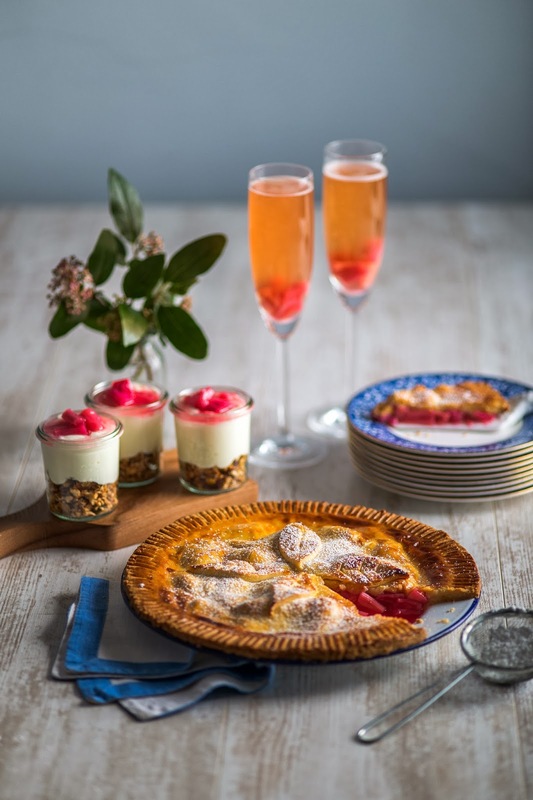 Pour the chilled syrup into champagne flutes, and then top up with the chilled Processo, Cava or Champagne, stir to mix and add a few pieces of rhubarb from the compote, then top off with more Champagne or Prosecco, pouring gradually, the mixture will bubble madly for a minute! Granola described once as 'a third layer of clothing on a cold morning' crunchy, nutty, sweet and spicy. We have this for breakfast with Greek yoghurt or loaded onto a big bowl of creamy porridge with lots of delicious compote made from rhubarb in the garden. 150g ready to eat apricots, cut into chunks. Pre heat the oven to 150C. Toss the dry ingredients together except the apricots, then add the oil and the honey and mix to coat thoroughly. Spread the mixture on two baking sheets lined with parchment paper and bake until golden, turning every 10 minutes so that it browns evenly. The granola should be ready after 30 minutes - cooking time may vary from oven to oven so keep an eye on it so that it doesn't burn. When it comes out f the oven allow to cool and then add the apricots. As the granola cools it will lose it stickiness and become crunchy. Store in a tightly sealed jar or bag. I use the traditional enamel plates to make this tart. They are about 20cm / 8inches wide. An 20cm/ 8 inch loose bottomed tart tin will work also. To make the pastry, in a food processor blitz the flour, sugar and butter until it resembles breadcrumbs; add the eggs and water make a non sticky doughy consistency. Knead the pastry on a floured surface into a ball, wrap in cling film and chill in the fridge for about 20 minutes. Grease the tart plate or tin and place the pastry on top (if pastry hangs over the side don't cut it off. Next toss the rhubarb in the sugar and orange rind, and put on the pastry base. Roll out the remainder of the pastry and place on top of the Rhubarb. Use water to seal the pastry base and top together and for a better seal and look, go around the edges and press down with a fork. With a sharp knife trim off the edges and pastry bits sticking out and keep for decoration. Make a few cuts with a sharp knife on the surface of the pastry a few times to allow hot rising air to escape while cooking and decorate your Rhubarb tart in any way you please! Wash some egg on the surface to create a glossy look when cooked and also sprinkle some sugar on top for taste and effect. Place Rhubarb tart into a pre heated over at 180°C/350°F for 45 minutes to 1 hour. 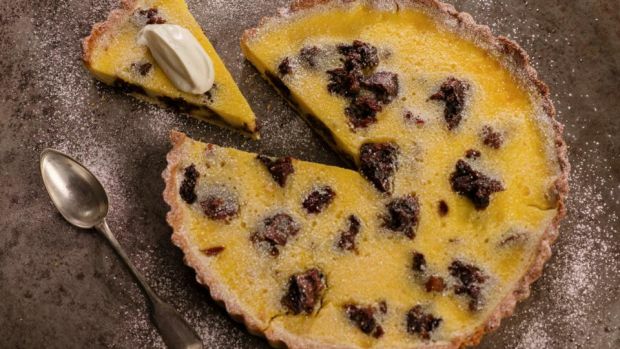 Let the tart cool and serve on its own or with fresh cream or custard. For the cake, preheat an oven to 150 degrees/gas 2. Grease and line an eight inch/20cm cake tin with parchment paper. Allow the cake to cool and then turn it out onto a wire tray and let it get completely cold, which will take a few hours. Meanwhile make the Swiss meringue. Place the egg whites and sugar in a large metal or glass bowl. Set the bowl over a pot of simmering water, and whisk, continuously, until the sugar has completely dissolved and the mixture looks opaque. Remove the bowl from the heat, add vanilla extract, and whip on high speed until completely cool. Whip in the butter, a tablespoon at a time, until thick and fluffy. If it begins to look curdled, continue to whip until it comes back together, before adding the remaining butter. Fold in the melted chocolate. If the egg whites and/or the butter are slightly too warm, the buttercream may not thicken properly. This can be easily remedied by placing it in the refrigerator for 20-30 minutes, then whipping again. To make the meringue mushrooms, pre-heat an oven to 130 degrees/gas ½. Line two baking sheets with parchment paper and set aside. In a clean dry bowl, preferable stainless steel or glass, whisk the egg whites and sugar together at full speed until the mixture forms stiff dry peaks. This will take eight to 10 minutes. Put a round tip about 10mm wide on a piping bag and fill the bag with the meringue mixture. For the stems, press out a tiny bit of meringue onto one of the trays, then pull the bag straight up. Do not worry about making all of the pieces exactly the same. The mushrooms will look more natural if the pieces are different sizes. To pipe the mushroom caps, squeeze out round mounds of meringue onto the other baking tray. Pull the bag off to the side to avoid making peaks on the top. Place the cocoa powder in a fine-mesh sieve and lightly dust it over the stems and caps then blow on the cocoa powder vigorously to blur it and give the mushrooms a realistic look. Bake for one hour and then turn off the oven and allow the meringues to cool in the oven. When cool, the stems are attached to the caps using a little melted chocolate to glue them together. The stems may need to be trimmed so use a sharp knife to cut the tip off each stem to create a flat surface. To assemble: Divide the cake into three evenly-sized layers. Line an eight-inch/20cm tin with cling film, place one layer of cake in the bottom of the tin, spread a thick layer of the icing over this layer, put the second layer of cake on top and repeat with the icing, and put the final layer on top of this. Cover with the cling film and pop into the fridge for 30 minutes to set. Remove the cake from the fridge, take it out of the tin and remove the cling film. Cover the cake with a thin coating of icing, then, using a ruffle nozzle, pipe the icing on the sides of the cake. Once the cake is decorated put it in the fridge for 30 minutes or so to set again. 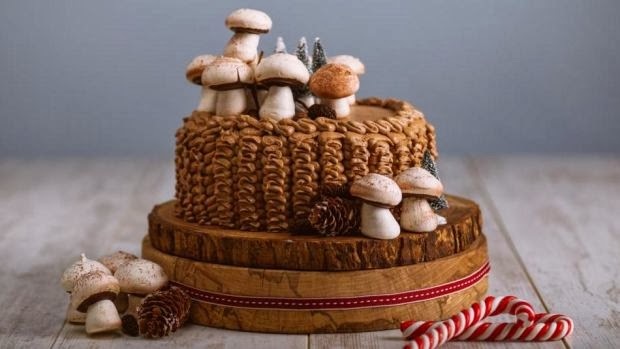 Decorate with the meringue mushrooms. This cake will keep for at least a week.